PDF Orientation : Using this option you can set whether to print the PDF in portrait or landscape orientation. Records per Page : Only applicable to Grids aligned horizontally, which allows you to set the number of records that will be printed per page. Records per Line : Allows you to set the records that will be printed per page in the pdf. Friendly URL : This field allows you to change the URL that will be called by the application. Allowed characters are the same available on URLs: a-z, A-Z, 0-9, -_. This option can also be changed on the home screen, on the “Friendly URL” column at the applications list. PDF measure unit : Using this option you can define the unit of measurement of the position of objects in the PDF. Used in printing format, it can be: points, millimeters, centimeters and counts. PDF Format : Using this option you can select the Form type in which the PDF will be printed (letter, A4, etc). PDF Destination : Using this option you can set where the PDF will be sent to the Browser, Download or server. Browser : If you use this option the PDF will open within the browser. Automatic page break: Use automatic page break on pages. Margins : Allows you to view the application on the page according to the values reported in the margins (right, left, top and bottom) in millimeters. Search Creation : Using this option you can set the PDF startup mode by the Search. So the initial mode will be a Search application. 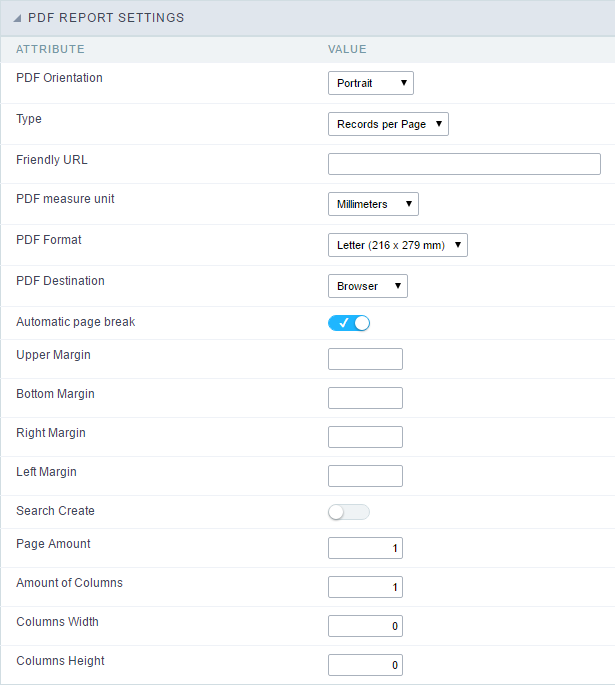 Page Amount : Allows you to set the number of pages that will be printed in the PDF. Amount of Columns : Allows you to set the number of columns that are printed, what allows you to create applications for issuing of labels printing for example. 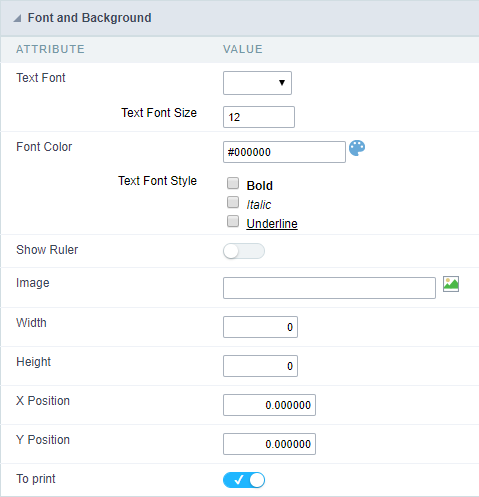 Columns Width : Allows you to set the width of the columns in the application. Columns Height : Allows you to set the height of the columns in the application. Configuring the PDF Preview allows you to set values of text and layout preview. PDF Report visualization interface settings. Text Font : Here you can choose the font family to be used initially by the Report PDF. Text Font Size : Here you can choose the font size . Font Color : Here you can choose the font color . Text Font Style : Allows you to choose the style of the text, if this will be bold, italic, or underlined, or any other combination. Show Ruler : Sets whether the PDF printing displays ruler at the edges of the pages. Image : Allows you to insert a background image on the page. This image will be also printed, it can be a watermark for your document for example. Width :Sets the image width, in pixels, to be inserted into the page. Height :Sets the image height, in pixels, to be inserted into the page. X Position : Sets the abscissa of the initial image position. Y Position : Sets the ordinate of the initial image position. Print : This option sets whether the image will be printed on the application.